The company will pay 12.25% assured return on cash down payment. (Assured return is paid till construction is complete. A lessee is assured for your unit with a min rent of Rs 36 per sqft. Minimum Investment: Rs 18, 00, 000.
with you to advice you on the entire project at your convenient time and place. inquiries about the above mentioned project. a mix of debt and pre-construction sales. Once completed this will be a self-contained IT destination. land, the internal rate of return is expected to be higher than that of normal investments in the IT sector. complexes, there will be also be demand for residential apartments, hotels, commercial spaces and other general facilities. corporation Wipro for their own use which will help establish the IT zone, without affecting external demand. free of pollution and with adequate green cover. the office, retail, hospitality and, to a lesser extent, residential sectors. Indian and foreign industrial houses, making the region the best industrial destination in north India. Rakesh Bahadur, Chairman and CEO, Greater Noida Industrial Development Authority. 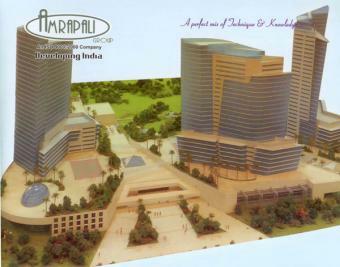 park, a special economic zone with 100 per cent export oriented units and a Rs 230 crore frozen food complex. conditioned building will have a parking capacity for 8,000 cars and 200 trucks at a time. involves the laying of a 36-km line from Tughlakabad to Boraki in Greater Noida. (approximately) 10,000 square feet of commercial space.